There is a new toddler bed, The Littlest Big Bed, now available for all in the catalog. And, for the adventurous Simmer, you can place this bed into your inventory, allowing you to be ready to put your toddler to sleep at a moment’s notice. We’ve also added some new traits and powered an old one. Never Weary has been improved. It now actually provides the full benefit of the word “never”. Seldom Sleepy is a new trait for Sims that like to sleep, but just don’t want to sleep that often. Needs No One, Forever Fresh, and Forever Full, are all new and improved versions of their counterparts (Independent, Antiseptic, and Hardly Hungry). Toddlers can now sleep in tents. Apologies to the parents that were using that as an excuse to find peace in the woods. Costume selections for the Incognito Costume Party now include more possible selections. Computers will no longer disappear when a Sim attempts to use the "Extract Fossil” interaction. Yep, there was a chance the computer would fade out of existence. Solid doors will no longer let light pass through them. We addressed an issue with some of the roof patterns appearing stretched when placed on the newer roof types. Vegetable Casserole will now be referred to as Vegetable Casserole, and not Tofu Casserole. Because Tofu are friends, not food. The Over-Achiever achievement will now complete with any 5 Aspirations. We fixed an issue with cfHair_BraidedPonyTail that was causing seam lines to appear on the face and neck of female children. Sims will be less likely to auto-choose a tent to nap within when their energy is low. Basically, they were always choosing a tent regardless of what other sleeping options were present. The player clicks on a cell and chooses the criminal to lock away. And the player clicks on the criminal in order to release them. The yfBottom_EP03SkinnyJeans are now sorted in the Skin Tight category. Sims will now be more likely to purchase items from the craft sales table during a yard sale. We fixed a crash that could occur if a yard sale was started after the Sim chose to initiate a vacation. We fixed an issue that could cause pets placed from the Gallery to have missing textures once in game. Pets in labor will no longer attempt to stand upright, causing them to distort in their portrait images. It was scary… animal rights groups were greatly concerned. Customers will now appropriately leave the restaurant if the Host Sim has left the lot. Vampires will no longer get burned by the sun when underground. The Dead Hawthorn Tree can now be placed above basements. Vampire offspring relationship status will no longer be forgotten as a result of the Vampire Sim not having built any relationship with their offspring before turning them. It’s true. I mean, how often do you get to know your sire, prior to being bitten? Usually it’s a quick bite on the way to the office… just a little snack before bedtime… never really any time to ask the important questions. As a result of night starting earlier in Windenburg, vampires can now go out earlier, and not get burned, in Windenburg too! 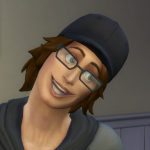 Facial details for a vampire sim's dark form should no longer reset to their default settings after initially editing and then re-entering Create a Sim. …and by dump, I mean a properly decorated abode eliciting a specific mood or feeling as a result of the addition of eclectic wall decals. For purposes of recipes that request a fruit, it should be noted that garlic is not a fruit. Vlad now has level 15 Vampire Lore. As the writer of this release note, it should be noted that I disagree with this change on the grounds that as a human, I would say my human lore is pretty low. I'm sure Vlad was there for all of vampiric history, but was he really aware of it all… I think a solid 11 or 12 lore tops. But we can save the debate for another time. Changing outfits will no longer remove a teens acne. The yfTop_GP05JacketSporty no longer causes a strong shadow to appear along the waist line when paired with various shorts in Create a Sim. Sims with maxed manners will no longer queue up wash dishes repeatedly. Dang it… does this mean I have to wash my own dishes now?